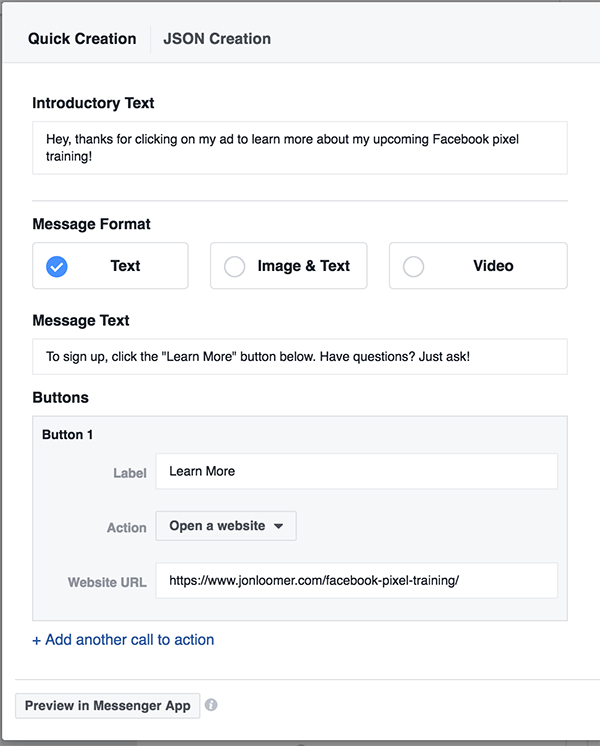 Facebook has added several features and options to Facebook Messenger ads over the past several months, providing new ways to communicate with customers and potential customers. However, advertisers are often confused about how to use these features. In each case, I’ll help you understand what each feature is and how you can use it. 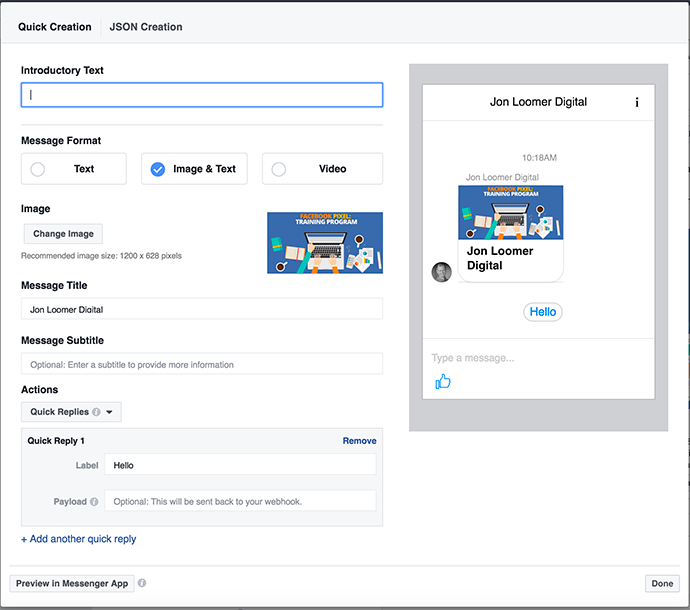 Messenger Destination allows advertisers to create ads that send people into a conversation within Facebook Messenger. It’s important to understand that Messenger Destination is not a placement. When creating an ad, you’ll have the option of choosing your destination. 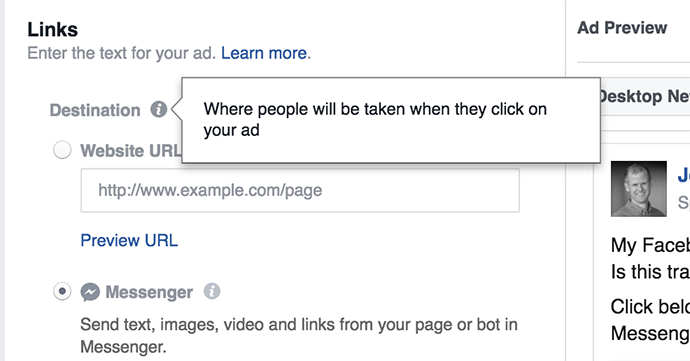 In other words, where will people be directed upon clicking your ad? That will typically be an external URL. But when using the Conversions or Traffic objectives, that could also be Messenger. If you choose Messenger as your destination, you’ll first need to upload an image for your ad. Facebook recommends this image be 1200 x 628 pixels, or a 1.91:1 aspect ratio. Next, you’ll need to provide the rest of the content of the ad: Headline, Text, Call to Action Button, and Newsfeed Link Description. 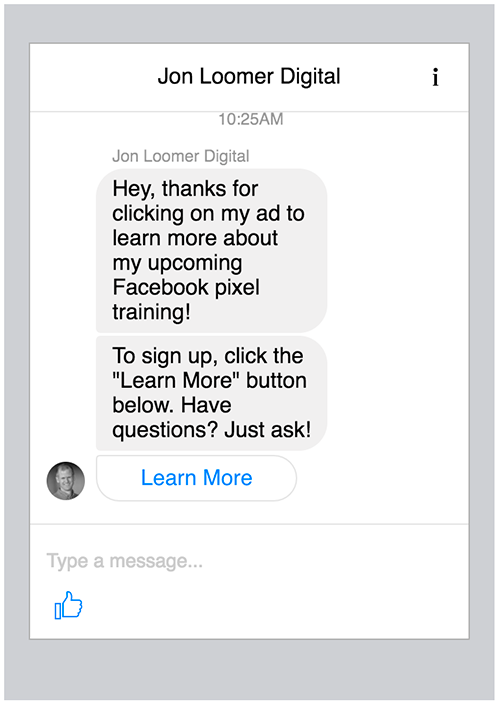 As mentioned earlier, once someone clicks that ad they will be directed to a conversation within Facebook Messenger. You also need to set up what that will look like. 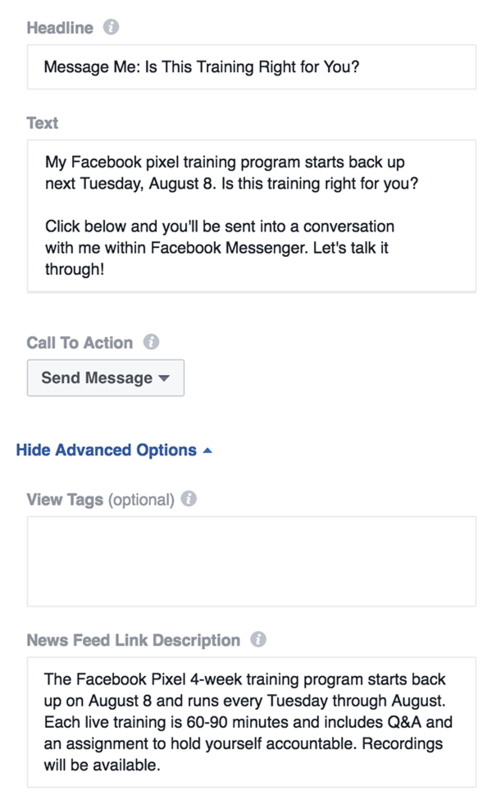 Your Messenger content can be text only, image and text, or video. Let’s focus first on text, using the “Quick Creation” method (JSON is much more advanced and needs its own blog post). You’ll need to provide introductory text (optional), message text, and button. The introductory text simply appears above your message text. The button is a simple link below that will drive the user to a different destination. If you have a bot, you can use the button as a postback (this again is a discussion for a new blog post, so we’ll focus on using links). For video, you’ll need to provide introductory text, a video file (no more than 25 MB), and a quick reply. The quick reply will be sent immediately upon the user sending a message, so make sure it’s something that will make sense in all situations. In the case of Messenger Destination, your ad may appear in several different placements (desktop news feed, mobile news feed, Instagram feed, etc. 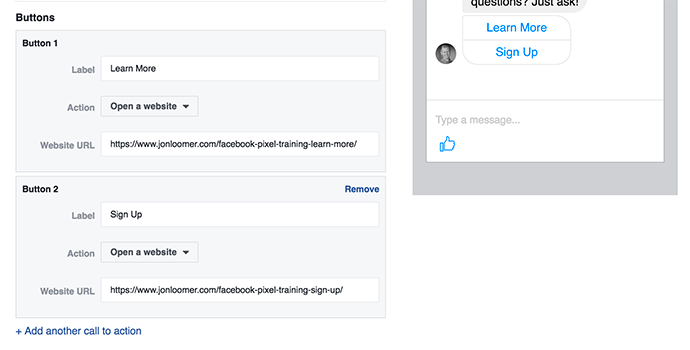 ), but send the user into a conversation within Facebook Messenger. But placements are also available within Messenger. 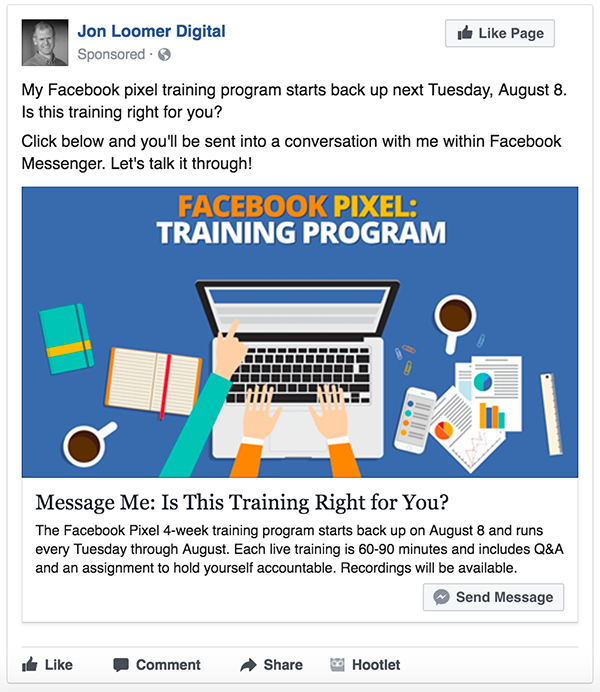 This ad would appear within a user’s Messenger, on the home screen, and below their messages. Note that there are no limitations to targeting when using the Messenger Home placement. As you noticed above, Sponsored Messages is also a placement option. 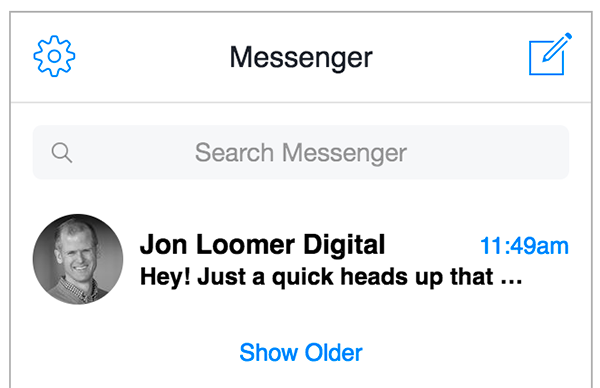 A Sponsored Message will actually appear within someone’s messages in Messenger, not just within the Home screen. To do this, though, Facebook limits whom you can target. 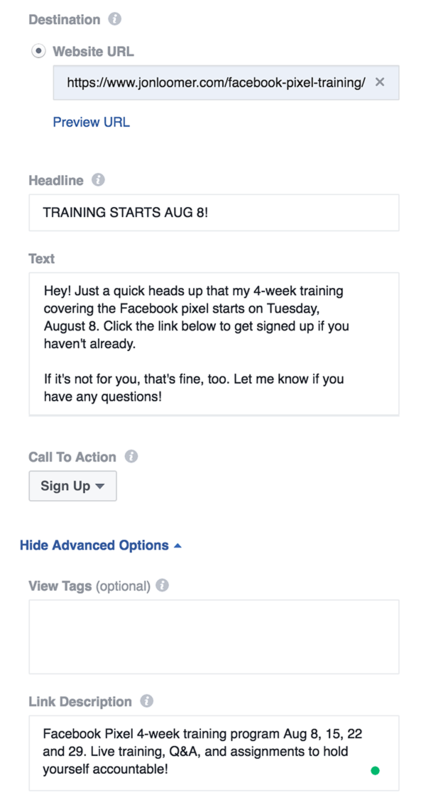 When selecting Sponsored Messages, you’ll only be able to target those who have messaged your page before. We’ll get to that in a minute. Upon turning this placement on, all other placements are removed. 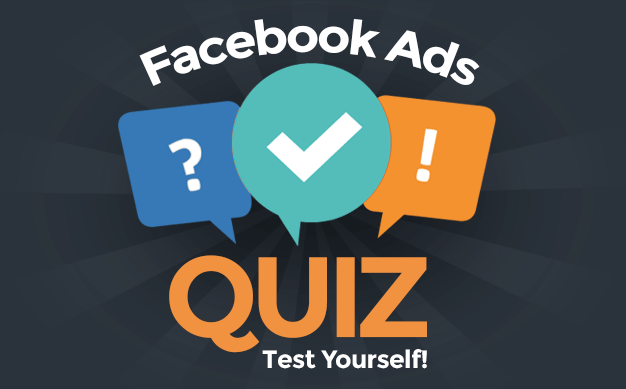 Within the ad set, you also must select your Facebook page. Don’t forget to do this! 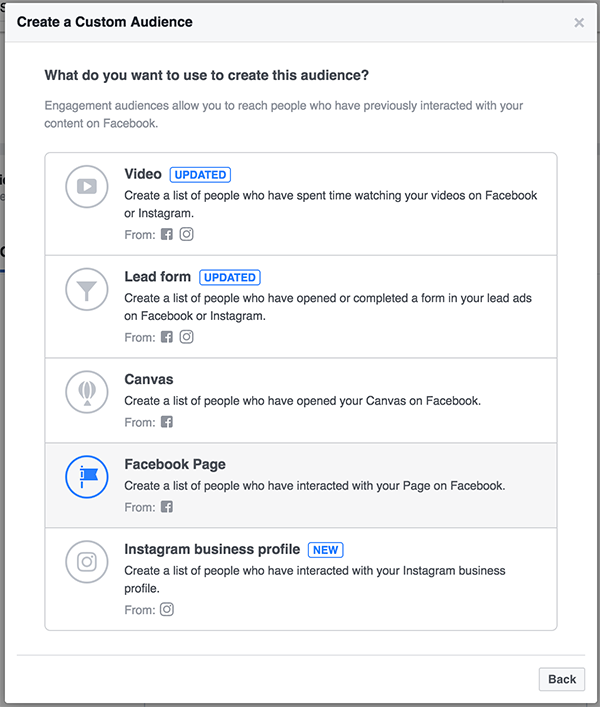 The only audience you can target is people who have messaged your page before. 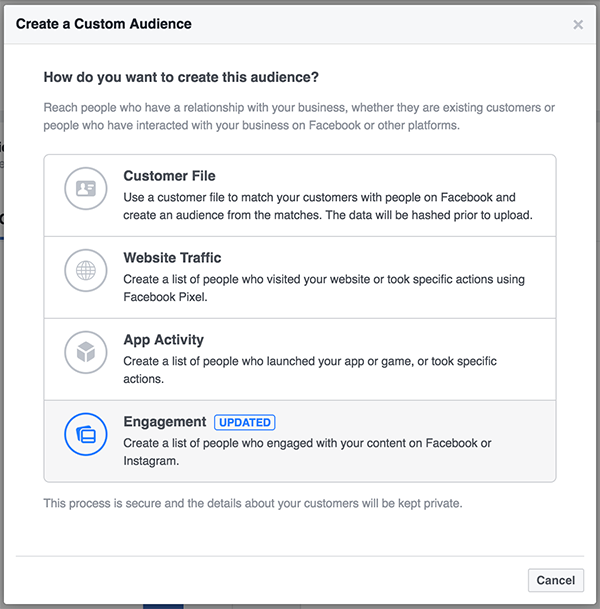 This is one of the audiences you can create within Page Engagement Custom Audiences. If you’ve created one of these audiences before, it will appear when clicking into the Custom Audiences text box. 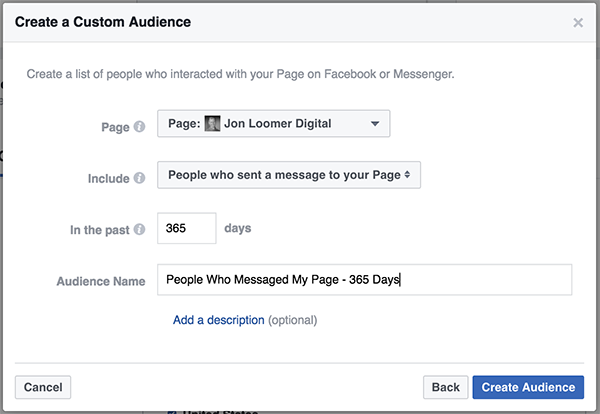 If nothing appears and you’ve created one of these audiences before, make sure that you selected your page earlier. That created frustration for me initially. I recommend using 365 days, unless you get a ton of messages. Otherwise, this is going to be a very small audience. After clicking to create the audience, it will automatically be added to the targeting within your ad set. 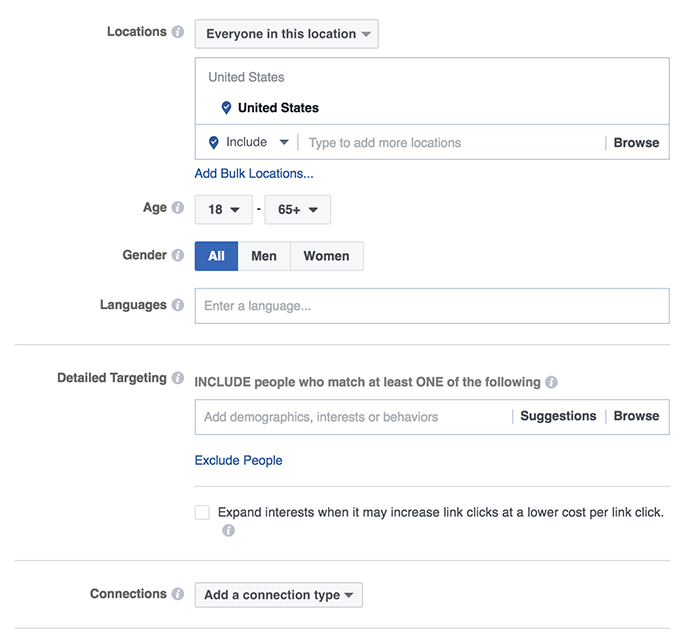 Note that you can add targeting for locations, age, gender, languages, detailed targeting, and connections. Keep in mind that all this does is filter your audience of people who have messaged your page. As you add targeting, the audience will only get smaller. You can only optimize for impressions, meaning that Facebook will show it to as many people within your audience as many times as possible. Given the small size of the audience, it’s probably best to use this option anyway. You’ll need to enter a manual bid. Facebook uses $30 by default (or at least that’s what I get). You should experiment with what works best here. When creating your ad, you’ll notice that “Single Image” is your only format option. Messenger Destination: This is a good way to get a conversation going about a topic that may be a bit more complicated. Think higher priced products, service quotes, or anything that may generate questions prior to a commitment. Broader audiences are okay here. 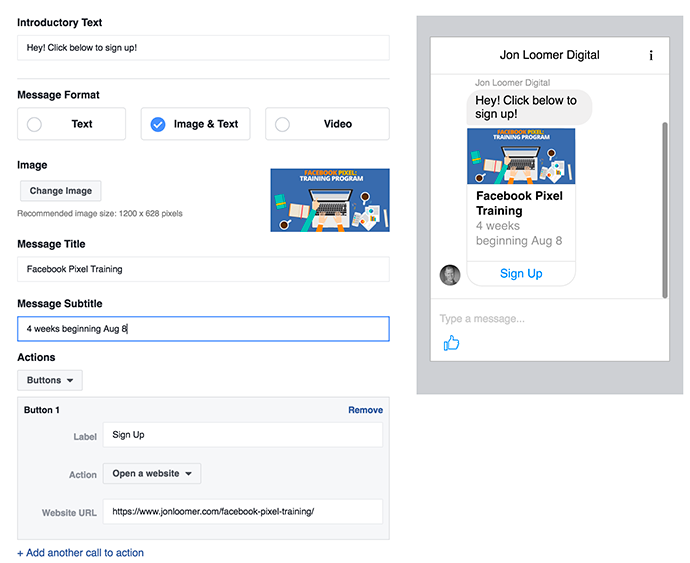 It’s also a good way to increase the number of people who have messaged your page — an audience that can be used for Sponsored Messages placement. Messenger Home Placement: It’s just another placement. If you use automatic placements, you’ll be using this without knowing it anyway. So this placement is all purpose. While it’s not as intrusive as Sponsored Messages, you should still monitor how this performs and respond accordingly. 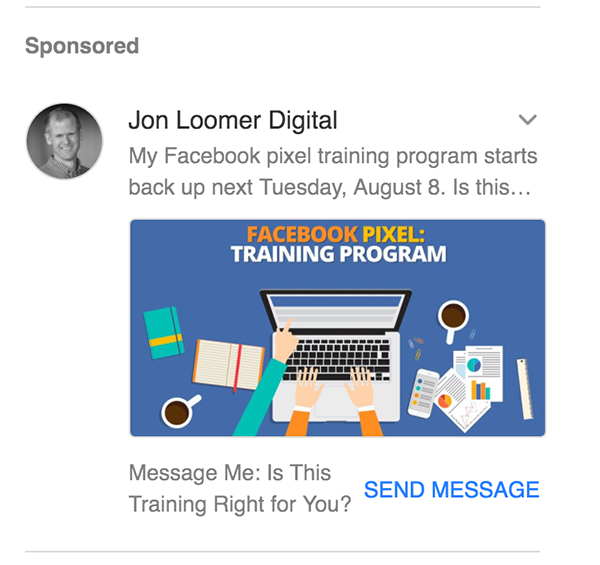 Sponsored Messages Placement: You’re sending someone a private message within their Facebook Messenger. This is about as intrusive as advertising gets. That doesn’t mean you shouldn’t use it, but you should do so with caution. It’s good that you’re limited to targeting only those who messaged you before. That should cut down on the complaints. And if done properly and respectfully, you may get great results. Similar to Messenger Destination, consider this an opportunity to start a conversation around something that tends to be more complicated or create confusion. Keep in mind that this placement is going to typically have a very small targeted audience, so your budget should be very small as well. 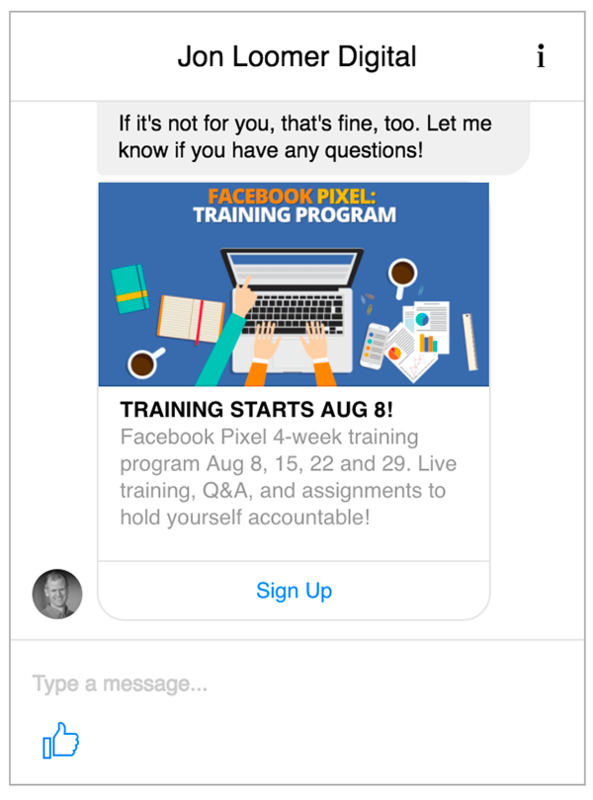 Have you started experimenting with Messenger ads yet? How are you using them, and what types of results are you seeing?